During the winters of 2006-2008, Joe and his team of 22 Alaskan Malamutes conducted a series of unprecedented, multi-month solo expeditions in Alaska's arctic Brooks Range and the Arctic National Wildlife Refuge (ANWR). 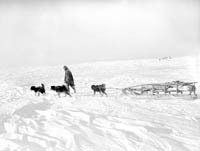 Pulling three sleds in tandem with two tons of supplies, Joe and the team mushed entirely without resupply for up to five months at a time without seeing another human being. The expedition was a tribute to the "forgotten explorer," Ernest de Koven Leffingwell (1876-1971). 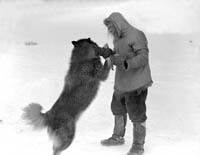 Leffingwell was a member of the Anglo-American-polar Expedition (1906-1908) which established that there was no land North of Alaska. Leffingwell is credited for mapping much of the Arctic coast and the Brooks Range, which is now part of ANWR, between 1906 and 1914. 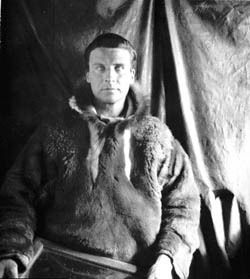 Leffingwell, along with the other members of the expedition, became stranded on the Arctic Ocean coastline. Their ship, the Duchess of Bedford, became ice-locked and unseaworthy, so the men used the wood from the ship to build a cabin. For the next eight years, Leffingwell stayed there to conduct his mapping project. 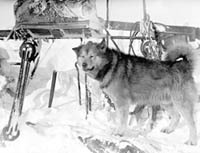 He traveled by dog team to cover ground in the winter and used a small boat to follow the coastline during the summer months. Traveling with Leffingwell's journals as a guide, Joe covered much of the same country, camped in many of the same localities, and experienced some of the same weather and ground conditions that Leffingwell had a century before. 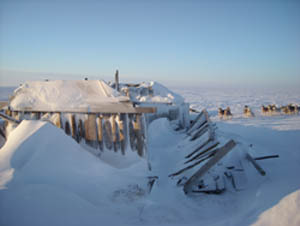 On the third year of the expedition, Joe found Leffingwell's cabin during a whiteout blizzard. He camped nearby with the team and waited for the weather to clear so he could snap some photos of what Leffingwell's cabin looks like today. Below is a photo of the cabin from 1906, and one from 2008. Please follow this link to Leffingwell's USGS Professional Paper 109 to see the product of his pioneering efforts in Alaska geology.